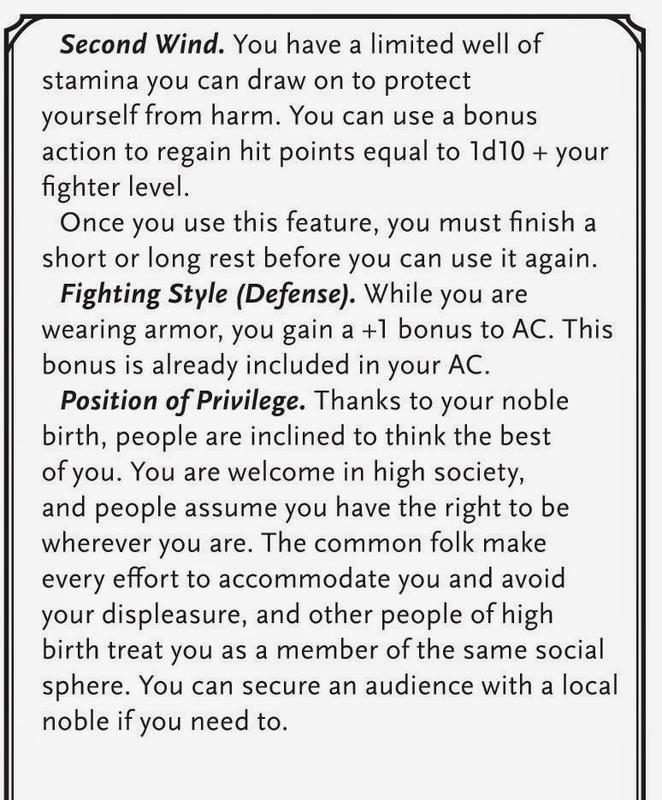 Mike Mearls tweeted this image of the D&D 5e fighter sheet from the Starter Set. Here we have the attributes. The standard array of Str, Dex, Con, Int, Wis, and Cha arranged in the new style with Physical attributes first and Metal attributes section. They chose to emphasize the bonuses as opposed to the original number. With the primary resolution system being d20 roll high versus target that is not surprising. However I would given equal footing to the raw attribute. While the bonus is what we use, the raw attribute is what we use to evaluate at a glance. +4 strength? Mmm OK. 18 strength, yeah now we are talking. Good or bad the 3 to 18 scale is entrenched in the DnD hobby. But I have to stress this is a presentation issue only. You still roll 3d6 (or your choice) and the raw number is not really used only the bonus. Name block, looks like standard stuff except for the addition of background. More on that in a second. Character information. With this in combination with backgrounds, 5e has more explicit support for roleplaying. I have no issue with this and feel that a minimal approach probably works better than the blank page approach of 4e or ODnD. We see that the noble background plays into the some of the information boxes particularly the flaw. The two combat boxes. 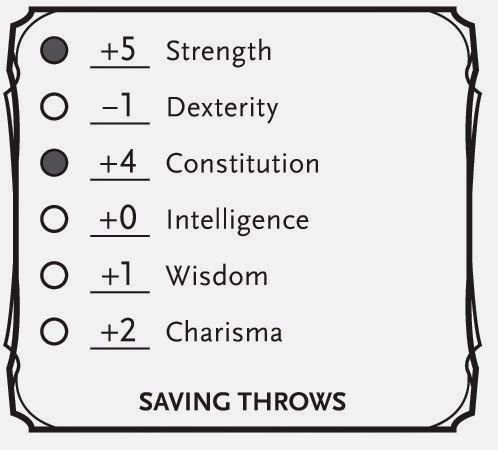 Looks pretty standard for DnD except for the Death saves. I believe if you go below zero you start making a Constitution save a round. Three successes means you stablized, three failures means you die. Makes for a mini game out of dying. Imagine the tension when after making two successful saves you start rolling failures or vice versa. Weapons are about your bonus and your damage which again is pretty much standard. Abilities, at first level this fighter gets Second Wind, Fighting Style, and Position of Privilege. The first two are probably from his class and the last is a result of his background. The mechanics of Second Wind are the same as 4e's encounter powers but I like how they write it up here. It definitely sounds more natural and logic then the pure game mechanics of 4e. The test will be in what the other abilities that only reset with a rest look like. Fighting Style (Defense) I think there will be more options in the Player Handbook when it is release. For Basic probably they will preselect everything. With that being said the abilities make sense. This fighter has the training to use his armor gear more effectively. I like how the background gives a minor ability that is full of flavor and hooks for adventures. The proficiency bonus this is probably the single most important number in DnD 5e. From the playtest every class has the same number. It is used for your attack bonus, saving throw bonus, and skill bonus. In short anything that your character is good at or rather proficient at will get to add this number in addition to the relevant attribute bonus. This also mean that a Wizard swinging a staff and a fighter with a Greatsword will have the exact same chance to hit regardless of level. In this respect it is like ODnD particularly at low levels. It may lead to some blandness as well. In my Majestic Wilderlands supplements I have fixed progression for each class that has MW abilities (i.e. skills). I tweaked them to what I thought best for the case. So a 4th level Burglar with stealth may not be the sames as a 4th level Claw of Kalis with stealth but both are better than Mr. Fighter who can only use his dex bonus with stealth. 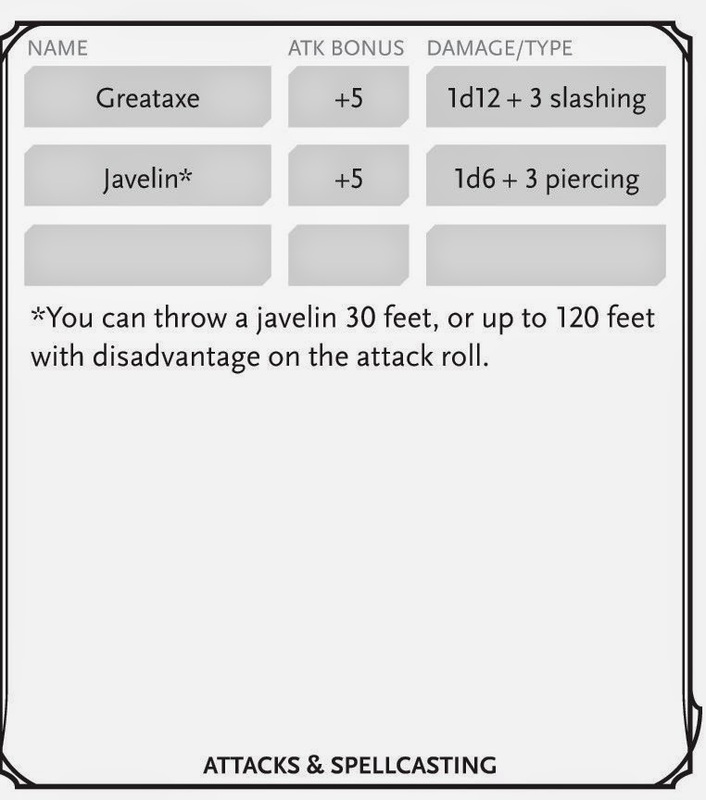 In the Player Handbook and the DMG there may be options to allow specific bonuses for skills based on a feat or background. We will have the see. Right now it looks like for 5e Basic if two characters are proficient in stealth they will have equal chance of succeeding at the same level and same dex regardless of class. The six saving throw tied to attribute seems overly fussy to me. 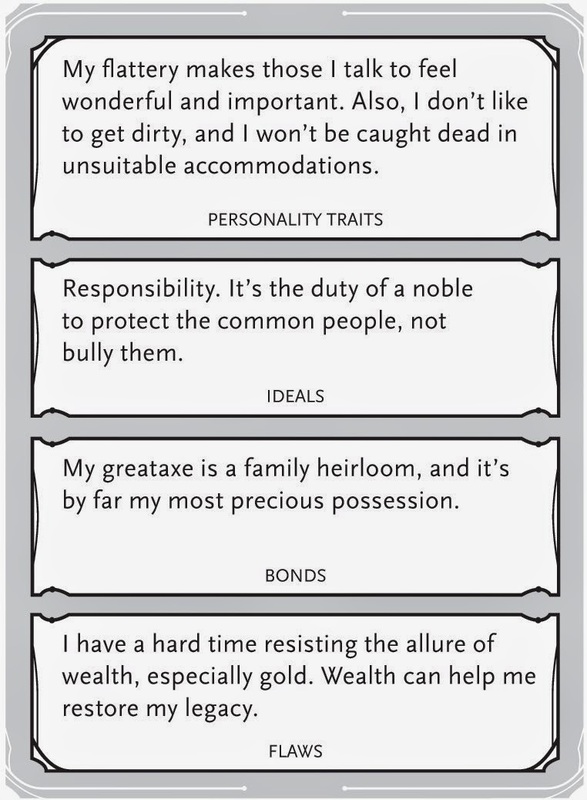 I would opted for Will, Reflex, and Fortitude of 3e myself or even the single save with modifiers of Swords and Wizardry. But it is not a deal breaker as long as how to use it is clear and understandable. Click on the above image, look at it carefully, notice how EVERY skill is filled out. Yup just like what Matt Finch recommended in the Old School Primer, and what I implemented for abilities in the Majestic Wilderlands supplement; Any character can attempt any skill just some are better at some skills than others. 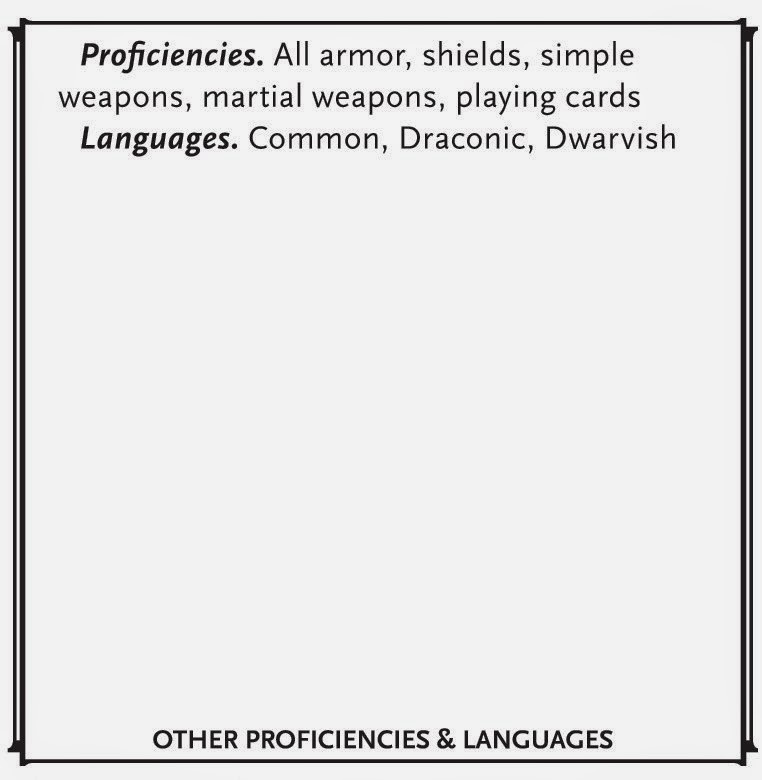 The way 5e appears to handle better is by marking it as the characters being proficient in the skill. Thus allowing the character to add his proficiency bonus to the normal attribute bonus. This wraps it up for the front half and in the next post we will look at the second page. You ignored that place for decades? One thing that is often hard to get right is figuring out why a dungeon or similar locale hasn't been looted before or dealt with. Often the reasons are contrived. There are several "interesting" places near my hometown, caves, quarries, etc. When I was young it felt like I was the first to discover it especially if none of my friends been there. But once I got older I found yeah people been tramping over these spots for many years. This is not a big issue but I did think of something plausible that would make a dungeon unnoticed, even if it near a settlement. If the dungeon has a lot of magical creatures or content the combination produces a low level aura. The effect of this aura is that unless you have an express desire to visit the place you unconsciously ignore it. Planning to build a road next to the entrance. The surveyors report they have to swing it out a bit further because of "complication." Clearing brush along the hillside? "Oh that spot can be skipped. To overcome this aura doesn't require a save or anything like that. You simply have to consciously and knowingly want to go there. For example finding a map and journal about how to enter the place is sufficient. Tracking a beast or group who used the dungeon lair as an entrance is also sufficient. I believe the Buffy tv series used a related reason as to why the inhabitants of Sunnydale were obvious to all the supernatural events that were going on. Tim, Dan, and I went to Origins Game Fair on the 14th. We all signed up to play some DnD Next at 8:00pm. The adventure was from the Legacy of Crystal Shards. First the story of what happened and then I talk about the mechanics under the fold. I got into a session of DnD Next at the Origins Game Fair. It was the Shards of Icewind Dale part of the Legacy of the Crystal Shards. I played Sir Endless Star a Paladin of Torm. We played at 1st level for the first half of the adventure and 2nd level for the second half. The adventure threw together two groups of old school gamers. Dan, Tim, and I from NW Pa. Ray, Mike and Rob from Harrisburg. Combined, we had a century of experience with tabletop roleplaying. The adventure proper involved us as guards escorting a caravan to one of the Ten Towns of the Icewind dale. We got attacked by Saber-Tooth Tigers and one of the wagons get knocked over during the fight. The party won but the carvanmaster wanted to leave the wagon and its merchant behind. The party agreed to stay and help. In the course of doing so we found a crate full of silver weapons which was a very unusual piece of cargo. We fixed up the wagon and begin moving to the town. Contrary nothing bad happen along the way. That is not until we hit the town. Even tho we started out hour behind the rest of the caravan, the traffic jam at the gate meant they were still trying to get through. Just as we had the town in sight a bunch of yetis attacked. We rushed down to the gate and threw ourselves into the fray. After several minutes of combat we managed to get the wagons in (including the one we were escorting) and shut the gates. In the aftermath, we learned that yetis are solitary creatures and this was very unusual. We were paid off for our caravan work and helped with the clean up. During the clean up a merchant from the local apothecary caught several of the party's ears. He had a tale of woe about he paid for protection from somebody named Slim and got nothing for it. Especially since he felt had to the "protection" money. Talking with the local sheriff, I found out that Slim was known for hiring out guards. Most of the party was excited about going after Slim and getting the merchant's money back. I reminded them that we are strangers in this town, that we had no authority, that we had only one side of the story. They were ready to ignore me until I firmly stated that if they did this as the Torm's hand on Faerun I would oppose them. We compromised on acting as the merchant's agent. I again pointed out that we did this right that having the merchant as a friend could help us as we were strangers here. Do this wrong we would be either imprisoned or forced to leave in the midst of a snow storm with yetis on the prowl. So we headed to the Northwind Tavern where Slim lived. We got directions to his rooms. Before I could knock, one of the more enthusiastic party members kicked down the door. For a second I thought out in the storm would be our ultimate destination. But Torm was with us and we caught the inhabitants of the room in the midst of a murder. Moreso one of the perpetrators was a Wererat. We all rushed into the room but the wererat was took quick. He shapeshifted into to a small rat and escaped. I went into the room and with my sword point at one of remaining human throat announced that I was Torm's Hand on Faerun, that they were outnumber and retribution would fall if they did not surrendered. They exercised their better judgment and surrendered. From the information gathered, we uncovered a conspiracy where Slim and his thugs were conspiring with one of the town leaders to take over. The Yetis were magically controlled and sent in to create chaos. The party learned they had supplies at the warehouse they needed to retrieve. We laid an ambush and broke the back of their conspiracy in the ensuing fight. Aside from completing my side of Map 1, I am almost done with all the Rivers. I just finishing swinging around the Ament Tundra and heading into the Ghinor Highlands ultimately to finish with the Southern Reaches. This weekend I headed out to the Origins Game Fair with Tim of Gothridge and Dan from the Monday night gaming group. The drive was about 3.5 hours and we got into check-in around 10am. Word to the wise, PRE-REGISTER. The line was a killer and it took us an hour to get through it. By the time we checked in the line has grown to probably a two hour wait. Dan grabbed some card game events he wanted and we all signed up for a 8pm DnD Next event. Another word for the wise. Don't sign up for a 8pm event when you have a 3 hour+ drive afterwards. Then we went to the dealer's area to see what could be had. The first booth we stumbled on was SJ Games and Dan roped me into a munchkin demo game. It was Dan, a nice SJ Games rep, a little girl, and I playing the game. Tim wanted to stretch his legs continued further into the vendor area. Just before another SJ Games staffer handed me a couple of munchkin bookmarks. If you don't know, these bookmarks are also Munchkin game pieces. The rules are printed on them and you can use them in a variety of way. One of the bookmarks was an Adventure Time! bookmark. The idea was to ask them the time and if they gave an expected answer "It 11:00am" Then you can shout No it is Adventure Time! Mathematica! You then get a Door and Treasure card to put into your hand. But if the person says "It's Adventure Time!" you lose a level. Figuring that the SJ Game rep was very aware of this, I decided to play a long con. We started playing around 11:15 and Dan had to leave for an event at noon. Shortly in the game I asked Dan about this and got him to tell everybody what time he needed to leave. I noticed that Dan didn't have a watch or his cell phone handy but the SJ Games staffer had a watch. During the next 15 minute I checked my cell phone and reminded Dan about the time. Then 20 minutes I played my initial cards and figured I could stock up with two money. I brought up Dan's deadline and causally asked the SJ Games staffer the time. He looked at the his watch and said it was 11:35. I slapped my hand on the table and loudly announced "No! It adventure time! Mathematica!" The look on his face was precious when he realized I played him. And then he broke out in a big smile. When I showed Dan and the girl the bookmark they all busted laughing. With a grin I collected my door card and treasure. However don't feel bad for the staffer as it was he who won the game in the end. After that Dan went to his event and I went shopping. Early on I ran into the Gamescience booth and Lou Zocchi. I filled him in on what was going at Judges Guild and gave him one of my test printouts of the new Wilderlands Map 1. I think he got a kick out of my story about how the Roll20 Virtual Tabletop is using a quantum noise generator as a source for random numbers. I picked up a package of huge numbered 3/8" hex sheets that included some blank wargame chits. In addition to dice the Gamescience booth has an assortment of older material including some Judges Guild. If you are looking for some mint copies he has both the original CSIO and the CS of the World Emperor for a pricey $200. Continuing on, I ran across the KenzerCo booth. I finally picked the copy of Bag War Saga I wanted. I also admired the sheer awesomeness of their 5th edition Hackmaster books. I passed on buying them. I could afford them but I knew the chances of me using them were near nil. Then I picked up some pretty dice for my wife, Kelly Anne. Some she keeps for herself and other she will use as toppers on the hair sticks she makes for sale. I found some Lego mini-figures for Gregory my youngest, and bought some Star Trek Heroclixs for my Jamie my oldest son. At my first Origins I bought some miniature walls and fencing from Acheson Creations. They make their miniatures out of tough plastic that holds a lot of detail. I looked at their booth again and found they had a bunch of medieval buildings this time. I bought a couple and under pressure from Tim bought some yurt. He said I got to have yurts in my game. Actually they are Pictish round houses but still. I found a couple of vendors selling D&D and Pathfinder miniatures and bought a couple. I finally have a set of figures I can use for animated statues. It was probably way too expensive I bought one of larger miniatures to surprise the J Squad with at the Gold Star Anime. Finally in the last rows I found the Columba Games booth. As readers know, Harn is one of my guilty pleasures. I been collecting Harn stuff since 1985. Not only that Columbia Games is always outstanding to deal with. Grant Dalgliesh was there and graciously let me prattle on about Harn for a few minutes. I thanked him for all the great work he and his dad has done over the years. It was a interesting conversation and it was great to see the human side of a company that I been dealing with for a long time.I aided their cause by getting Dan and Tim to buy a couple of the Harn books Columbia Games had at their booth. The next post will be about DnD Next. 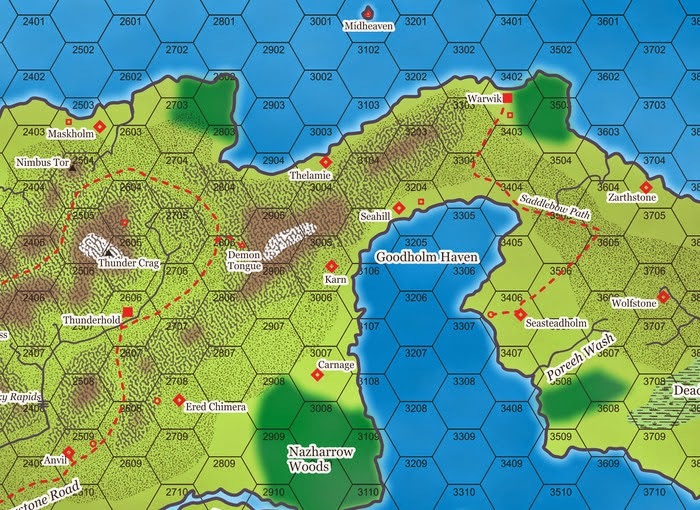 A couple of weeks ago the folks at Aethercon interviewed some of the Judges Guild team working on the Wilderlands maps, Robert Bledsaw III, Chris Bernhardt, and myself. If you are interested you can find the podcast here. The podcast was fun especially with Tim Kask as the moderator. I got to thank him for putting out at Adventure Gaming a short lived magazine he put out after he left TSR. The session quickly devolved into a gaming story swap meet. Mostly focused on how we each experienced the Wilderlands. I will be heading to Origins on Saturday the 14th. Making a roughly 3 1/2 hour road trip with my friends Dan and Tim. Hopefully meet some people, play some games and do some shopping. I will bringing my Majestic Realms Fudge RPG and dice for sure. I may pack Swords & Wizardry and my digest box of MW supplements as well. I have D&D Next on my iPad if that happens to come up. So look me up if you happen to be at Origins. It is another Harn Day in the Attic. I got the latest Harnquest from Columbia Games. For those of you who don't Harn is packaged into a series of loose leaf articles that you put into a binder. Columbia Games give an option to subscribe to all their new Harn releases at a discount. The releases are spaced anywhere from 4 to 6 times a year. It is a bit pricey even with the discount but the quality is always outstanding. The releases are a mix of old material that is reprinted and expanded and completely new material. Chimerae are the various hybrid creatures of legends like the Griffin or Hippogriff. This articles expands the original Chimerae article to include the Centaurs of Harn. It is a short but interesting take on a traditional trope. In recent years, Columbia Games has been releasing a series of short articles detailing the inns, taverns and other estabilshments. This is one is about a low rent viking bar. I found it very atmospheric and it features a lot of hooks to generates adventures from. A great resource if you want to run a campaign inspired by History Channel's Vikings. This is the expanded reprint in this Harnquest. Moleryn is the capital of a frontier province in the Thardic Republic of Harn. The expanded details include more details on the personalities of its inhabitants and details on the castle that is part of Moleryn. I particularly like how the endemic corruption of the Republic was fleshed out and detailed in this version of Moleryn. Each province of the republic is jointly ruled by a magistrate for civil affairs and a marshal for military. The Magistrate is not even physically present in the town and has turned over his official residence and subordinate offices to his corrupt relatives. I been asked where are the rules on Cow Hunting are? For new reader he is referring to an ignoble refereeing moment which I recount in this post titled Cow in the Attic and Tim gives his version in this post titled The Cow in the Attic - the players POV. I will show everybody exactly where to find the rules to hunt cows in Harn. Yes I know this is a geeky topic even for geeks like us. But hey some time you just got to dive in. First you need to know about Cows, this is found in the Cattle Article. In my own binders I placed this in the bestiary section of the Harnmaster Rules. In this six page article are Domestic Bull, Domestic Cow, Domestic Ox, the Auroch (which is very nasty), and the Wisen (bison). There are notes about breeds like the Themeson Dryder, and the Orbalese Longhair. Second you need to know how to hunt them. In the original incident I used the hunting rules for Harnmaster 1st edition which was found in Harnlore #4. The culprit for culmination of the cow hunt, aside from my poor judgment, was result 48-55 Moose/Cattle on the quarry table. I feel the system itself is quite good, although my judgement in applying it was questionable. When a character needed to hunt they cast for a trail by rolling against their tracking skill. If they find one, you roll to see how many hours old is it which determines how long it is. Then for each hour traveling you roll against tracking. Good results shorten the trail. Get enough good results you wind up within sight of the quarry. Which of course in this case was a cow. However these rules have been superseded by a new article on hunting. The new article is now 22 pages and far more comprehensive. There are character info, adventure seeds as well as rules on well... hunting. The old rules pretty revolved around tracking. Now there are straight forward options on ambush hunting, stalking quarry (like the old rules), quarry drives, and pitfall traps. If you don't want that level of details then there is section that abstracts foraging into a single table that yields the number of mandays of rations you find. With these rules you can setup an ambush for cows, drive cows, trap cows, and of course stalking cows. Or you could say to hell with cows and string up your referee. You could easily use these rules with classic editions of DnD even without a skill system. Just roll against the appropriate attribute. 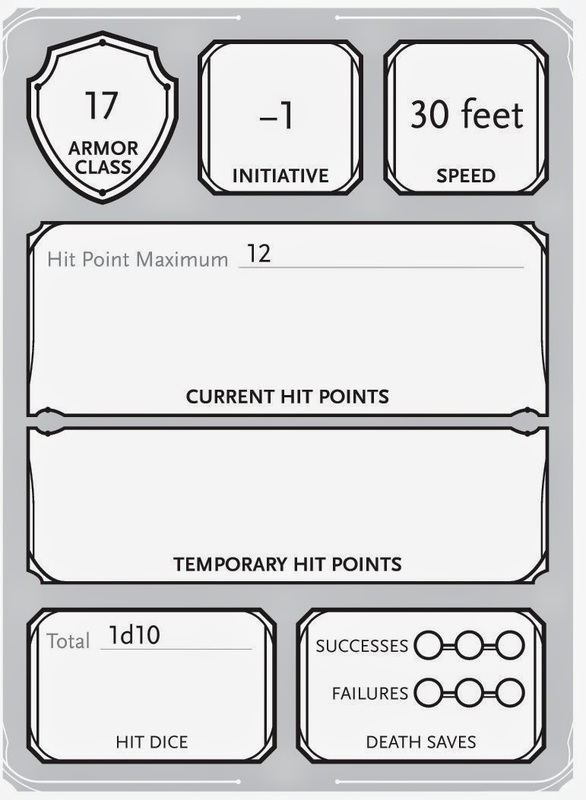 If you like to roll high add your attribute to a d20 roll and if you roll a 20 or higher you succeed. Harnmaster skill rolls generate four results. Critical Success, Marginal Success, Marginal Failure, Critical Failure. Harnmaster uses percentile and a roll under skill level system. Any roll ending a 0 or 5 is a critical. Success or failure depends whenever you are under the skill level or over. For d20 roll any roll divisible by 5 is a critical. So that how you hunt a cow in DnD or Harn. Judges Guild Kickstarter update: My side of campaign map 1 is done. 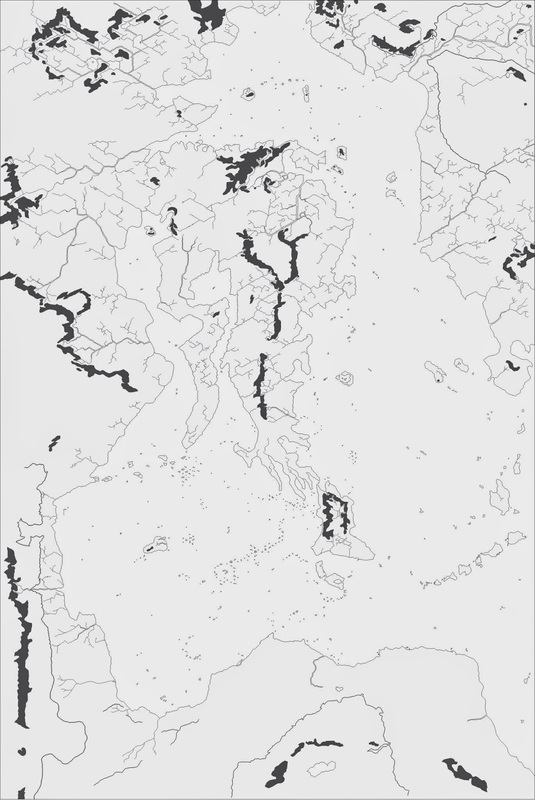 It is a cartographic style where terrain (mountains, hills) are b/w fills and vegetation is color.